The Written Word: I'm Now A Senior, And Summer Is Here! very nice! I like that it has shift-lock on both sides. It looks a lot like the 1948 KMC I got from Strikethru. Well, the KMC was actually the post-war Model Seventeen. They just changed it a little by adding the keyboard-margin sets. Congrats on the Remington. What's that neat paper you used? I think the pledge of allegiance expresses an IDEAL. And repeatedly pledging the ideal can have an effect on reality. For instance, I think many of us are too wrapped up in day-to-day events to fully realize the historic importance of the fact that we have our first African-American president. Like him and his policies or not, the fact that he was elected is a huge step forward in American society. For a view of how far we've come I recommend my summer reading, The Life and Times of Frederick Douglass. Oh, Matt, so much in this typecast---praise for an old Remington and a two-fold controversy. 1) whether a typosphere tlog should admit controversial personal views and then 2) a question into the nature of patriotism. Your view and Richard's form the material for a classic debate and I appreciate how calmly you both present it. I sympathize with your view but practice Richard's. For my part, I recite the pledge with the idea that reinforcing idealism is desirable and with that in mind, I do not say "under god". Someday we will attend ballgames and hear the volume rising and falling on various phrases throughout the pledge. There, now you have provoked a third controversy. Can't keep anything pure, can we? Maybe nothing is pure and everything is connected. Hmmm. There is an immediacy to a typecast which excludes time. The interim between the writers thought and the readers mind is interrupted only by the impact of a key, and that sound, though remembered, is eliminated along with time. The typecast is like a photograph of a thought. Unretouched. Non-conformity is the life blood of Jefferson, Washington, and Franklin; this hardly needs to be stated regarding Thomas Paine, the penultimate rebel. One might say this Nation was guided to its revolution and final independence by the lights of non-conformity. Departing, even symbolically--or especially symbolically--from the course of the majority, which has become more like the shuffling of a herd than the marching of saints, is vigorously supported my me, whenever that departure from conformity originates in a true heart. Your departure from conformity--ceasing to say the Pledge of Allegiance--seems to me, as conveyed with moving sincerity in your typecast, to have originated in a true heart. And IDEALS, if they are to effect reality in a positive way, must confront reality, not deny it. The Pledge of Allegiance soothed my discomfort with the reality of this Nation when I recited it decades ago. That recitation by my generation has done nothing to promote its stated ideal, and did in fact promote only weeniness and conformity, not courageousness and justice. Matt, I do not envy the discomfort your decision might cause you (though it may cause you none--lucky for you if that's the case). But I do so covetously envy your sincerity and courage. Your silence during that pledge is reverberating through this little part of New England. Thanks for the post, and congratulations to your Remington Model 17. 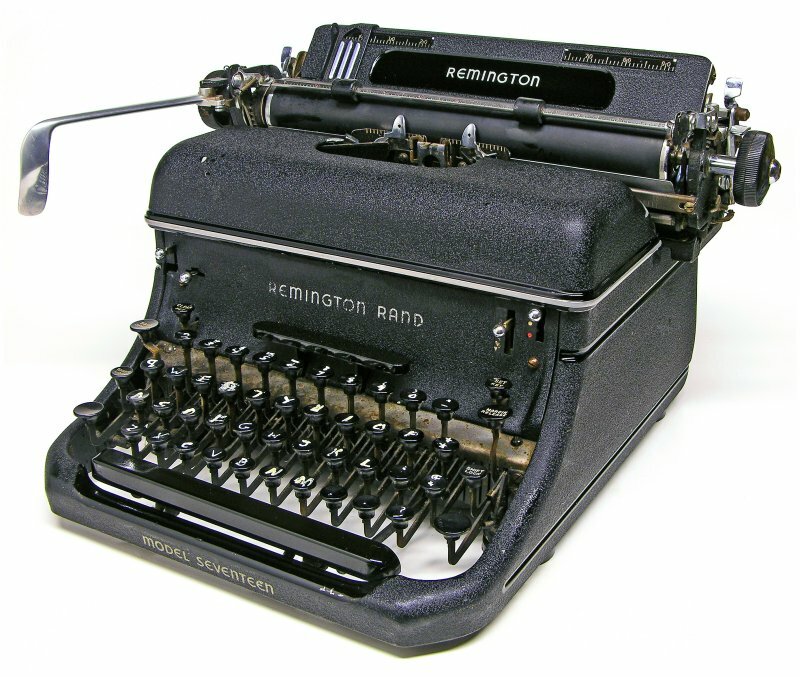 I have a KMC myself, it was the first typewriter in the collection. As to holidays, when I was your age, it was the contrary: people heard much LESS of me all through July and August. Enjoy the Seventeen Matt. I'm glad it found a good home. As to the Pledge, it's *you* pledging as a citizen to aspire to liberty and justice for all. The Pledge, in my eyes, is not an oath of conformity, but a pact between you and that flag as to the kind of American you pledge to be toward it. Hi, Matt. I found your blog today through the Inquirer story from last December. I really enjoy it. My interest comes from the fact that my nephew Mike and I just started a blog called Two Typewriters (http://twotypewriters.wordpress.com). He just bought a vintage typewriter and last summer I found the typewriter I had as a kid in my mom's attic. 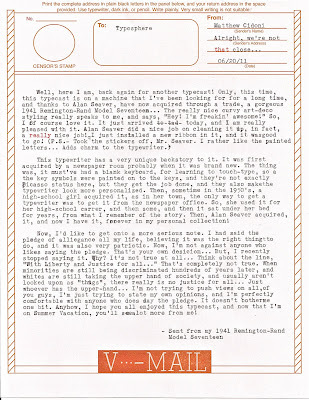 So Mike and I have decided to strike up a snail-mail typewritten correspondence blog. 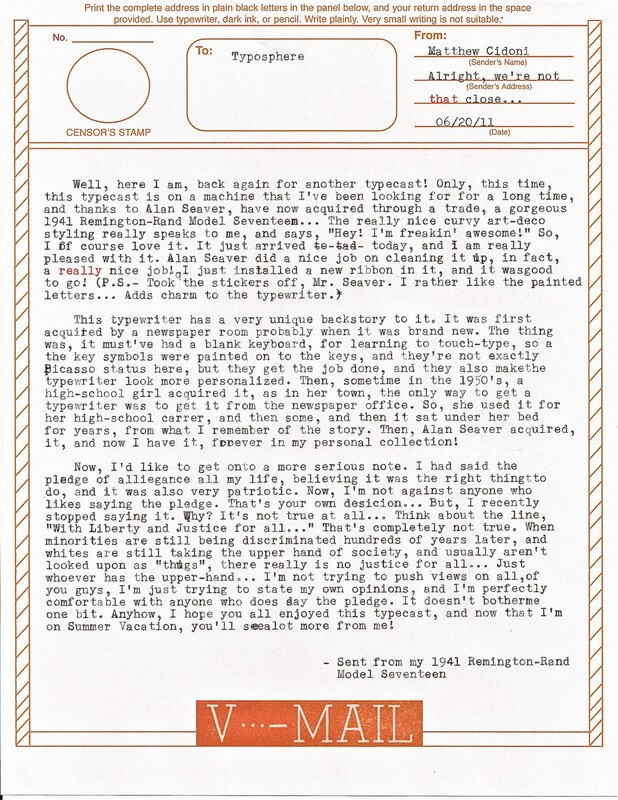 I just scanned and posted the first entry, Mike's initial letter to me. Hey Matt, it is your blog. If you think about it, this typewriter blogging thing is really a means of expression - not just an end in itself. Say what you believe. Thank you all for your supportive comments! I'm happy to have people understand and respect my views, although some of you may not agree with them. I just want to let you know that the respect is mutual!